Obviously muscadines are way up the list of my favorite fruits, but there is one fruit tree that I love and I believe you will love them too. Asian Pears are a fantastic fruit and they are some of the sweetest pears you will ever eat in your life time. The first time I tried Asian Pears I was shocked by the amount of juice that came from the pears, usually traditional pears are crisp and firm where Asian Pears have the same texture but a lot more flavor, sweetness, and juice. We recommend spacing the trees about 20 feet apart and for pollination purposed we recommend planting 2 different varieties. My favorite 2 varieties are the Shinko and the 20th Century. Mature height can reach in excess of twenty feet tall but you may keep the tops cut out of the tree to reduce height and promote lower branching. Asian Pears like a ph around 6.5, and we recommend fertilizing newly planted trees with a pound of 10-10-10 in early April and again in mid- July. Make sure to keep the fertilizer out about 15 inches from the trunk. 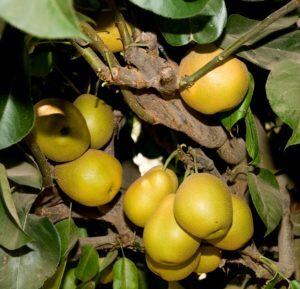 Asian Pears will make a great addition to your home orchard, plant yours today.